Animal Barn welcomes your pet to our home away from home. Boarding is more than housing and feeding a dog. Whether short or long term boarding, your dog has emotional as well as physical needs in your absence. Animal Barn strives to meet all the needs and desires of your particular pet, and we try to make our pet care facilities a pet resort. Your pets will enjoy a relaxing, carefree vacation in our pet resort. Our staff of trained professionals will make sure each of our guests is provided with individual attention and love. The key for us is to provide individual attention to each of our guests so they can all feel as though their owners and friends have not really abandoned them. Our typical day includes exercise and potty time first thing in the morning while the kennel is being sanitized and breakfast is being prepared. After breakfast, all pets can enjoy the indoor/outdoor runs at our pet resort. 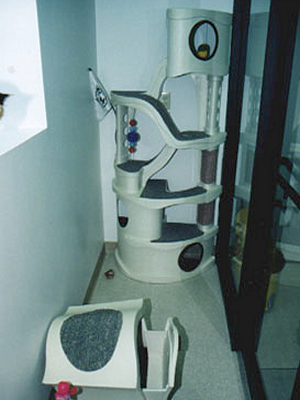 Your pet will enjoy the areas we have designed to entertain them. 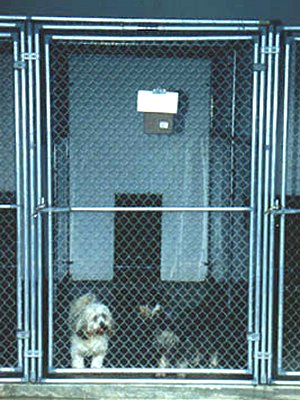 During extreme weather conditions, pets are in their 4x6 indoor climate controlled rooms. We truly do have a pet resort for your furry friends and we will take care of them in any environmental condition, through any time of year with no extra fees. We make sure to give each pet exercise and potty time, which is repeated in the evening before returning to their room for dinner and a good night’s rest. We encourage you to bring items that your pet is familiar with such as beds, blankets or toys so they feel as comfortable as possible. While we do have a fun place for dogs to play in, and have an immense amount of fun, we do want to make sure that each pet actually does feel at home. Please make sure that any bedding, or other objects you bring are washable. Come to Our Boarding Kennel Where Our Staff Will Ensure… A One-Of-A-Kind Vacation For Your Cherished Pet! We want to keep your pet’s area clean, and ensure your pets are healthy when you come to take them home. We also require current proof of vaccinations, including DHLPP, Rabies and Bordatella (kennel cough) because your furry friend will be in the same areas as other animals, and we need to make sure no one is going to harm the others. One might think that cats are easier to take care of than dogs when they initially get a cat for a pet, and in a lot of ways they would be correct. However, cats require a special sort of attention that dogs do not and are also susceptible to loneliness and dependency upon their owners, just like dogs. Cats need to have their fur brushed to keep it healthy and to help it shed as well as needing to be fed and watered, just like dogs. However, cats also do love attention, and while they are not always as obvious about their needs as dogs are, cats do try to tell you they want your affection. A deprived cat is an unhappy cat, and those are the ones that may give cats a reputation for aloofness. Our cat care-givers have had years of experience taking care of cats, and we excel in providing your cats the best time away from home they can have. Animal Barn has a huge dog facility, but don’t let that fool you. We love cat sitting and felines are our friends too. 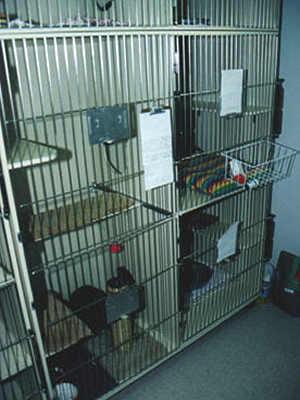 Our cattery is totally separate from the canine quarters and provides each feline with a comfortable and roomy condo in a bright room with large windows. The cattery is completely climate controlled, so while we are cat sitting for you your cat will not suffer fluctuating temperatures and an uncomfortable environment. 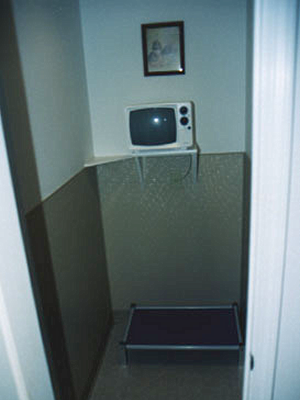 It also includes a playroom complete with kitty furniture, scratching post and a window for your furry friend to take in all the outside scenery. We take cat sitting seriously, and will make sure you cat is purring while here. Our cattery is not only climate controlled and a healthy place for our clients’ cats, but we also provide a place for them to have fun. With rooms full of toys and well lit areas with lots of windows, your cat will feel right at home with window hunting and playing with the toys that appeals to it most. We also make sure that each of our boarders is caught up with their vaccinations to ensure the healthiest atmosphere for the entire population of our boarders. If your cat needs a place to stay and has a contagious disease, then we will provide your friend a solitary place to stay where he or she can still fun and a nice place to play and be adored without causing other pets to become exposed to your pet’s ailments. Current proof of vaccinations is required including FRCP, FIP, Rabies and Feline Bordatella. In order to better serve our clients, we offer After Hours Service. This service allows clients to make special arrangements to drop off or pick up their pet from boarding at the kennel outside of our regular hours of operation. The charge for this service is $25.00. After hours arrangements MUST be made in advance and are subject to availability of staff. Boarding charges are calculated similar to human hotels; you are charged for a full day the day the pet checks in. Check out time is 12:00 noon. You will be charged for a full day of boarding after 12:00 noon unless your dog is bathed or groomed. Discounts will be given for housing 2 pets in the same run. No Checkouts on Holidays. Please feel free to come visit our facility anytime during normal business hours. Carson’s Capers: For the dog who really sinks his teeth into playtime. Give him/her an intense session of tug-o-war. Yes, enroll my dog in _____ 15-minute sessions at $8.00 each. The Barker Parker: A stimulating game of fetch. A Play Pal will throw your dog’s toy of choice to chase and/or retrieve. Henry’s Hundred-Yard Dash: Does your dog love to run like the wind? Our Play Pals will let your canine chase them around the exercise area. Or, if he/she enjoys a brisk walk, we can do that, too! Let’s do the furry scurry! Roxie the Executive: If your dog is more of the supervising sort, then he/she can spend time in the CEO’s office managing the Animal Barn. Sophie’s Choice: This is a reassuring session of one-on-one TLC. A Play Pal will hold, pet, and talk to your dog. Kisses are free! Miss Lily’s School of Etiquette: This is simply a review of manners while you’re away. We’ll practice sit, stay, down, and heel, and anything that has previously been taught. Yes, enroll my dog in _____ 15-minute sessions at $8.00 each. an activity and/or weather. Regardless, your pet will receive the time period you have purchased. The Pounce & Play: Our “frisky” guests will experience one-on-one time with a Play Pal while they hone their predatory skills stalking and pouncing on everything from catnip mice to feathers. This is a high-intensity session that will justify your cat’s reason to sleep for the next 20 hours. Yes, enroll my cat in _____ 15-minute sessions at $8.00 each. Kitty Kuddles & Kisses: If you can’t lie on your couch without your cat joining you, then this is the program for him/her! Animal Barn knows that, contrary to popular belief, many cats crave human affection as much as their canine counterparts. A Play Pal will offer your tender kitty a 15-minutes affection session that is truly the Cat’s meow. This activity is very comforting for first time borders.